Villa Montebello is a five minutes drive from Sandy Bay with two of the most beautiful beaches of South Africa. Driving along the coastal road, you will admire white sands and mountains dropping into the shining ocean blue. Hout Bay beach and its picturesque harbour, with numerous shops and a wide choice of restaurants are close to Villa Montebello. At the end of the day, why not board a boat to admire the sunset, or in the daytime, cruise to the seal island and when it is the season, watch dolphins and even whales swim by. Each Sunday, the local artisan market in Hout Bay offers a wide variety of gifts to choose from, all produced in South Africa and its neighbouring countries. 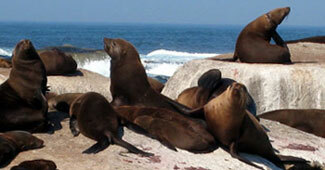 Hout Bay is ideally located in the heart of the Cape Peninsula. Roads leaving Hout Bay offer great views of the area, and give easy access to many well-known points of interest for visitors. The coastal road, the M6, which climbs towards Cape Town will take you in no time to Camps Bay, the cool place to hang out. It’s also a great place to play beach volley, try one of the cosmopolitan restaurants or have a drink at one of the trendy bars. The main land road will take over to Constantia, and its lush green valley with famous wineries, such as Groot Constantia, Klein Constantia and Buitenverwachting. You can go for wine tasting at one of the estates, buy some of the best South African wines, or enjoy a gourmet meal in one of the old charming wine farms. Don’t forget to visit the splendid Botanical gardens of Kirstenbosch where you will learn all about the different varieties of protea, the emblematic flower of South Africa. On a Sunday afternoon, go for a picnic in the park with a good South African bottle and enjoy an open-air performance of classical or traditional music, while admiring South African multicultural openness. South of Hout Bay, the road to Chapman’s Peak is one of the most scenic drives in the world. Narrow and winding, it offers breathtaking views of the ocean, Hout Bay and its fishing community. The road will then take you to the Cape of Good Hope through a nature reserve, where baboons, ostriches, buck and also many flora species, specific to South Africa, can be seen… Reaching by foot Cape Point lighthouse, you will be rewarded with the most beautiful view in this desolated area of the world, where the blue and the green waters of the Indian and the Atlantic oceans meet. If you like horse riding, you will enjoy the freedom of long rides on Noordhoek’s infinite beach. The Penguin colony at Boulder’s beach is a unique sight, and more uniquely is the possibility to swim with them. The colonial houses of Simon’s Town and its naval base are all very picturesque. Cape Town’s harbour was transformed some time ago into a shopping and entertaining centre for city dwellers and tourists alike. It is called the « Waterfront ». The buildings date from 1860, at a time when Prince Alfred (the son of Queen Victoria) decided to develop Cape Town by having the first dyke built to protect its harbour. Some of the old buildings have been restored and new ones but built in the same Victorian style were added to host shops and restaurants with outdoor tables which together have turn the harbour into a very charming area with seagulls and seals to remind the visitors they are still in a harbour. The Waterfront is definitely a great example of harbour rejuvenation, and a place appreciated by South Africans and foreign visitors. Located between two oceans, Cape Town enjoys a Mediterranean climate with pleasant summers and temperatures between 18 and 30 Degrees Celsius (November to April), and mild winters with temperatures between 7 and 20 degrees Celsius (June to August). Rainfall is moderate throughout the year, and sea winds provide some fresh air in the summer, though they can be stronger in winter. Your hosts will be happy to provide you with more information would you wish so, and will put guide you in the right direction.